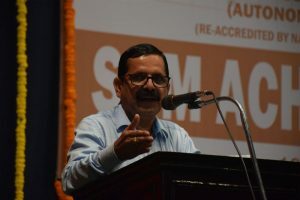 “In order to achieve intellectual supremacy, students must focus on building a talent base that wills to transcend the limitations of academic learning and explore new things”, said the NSS State Planning Officer Dr. Gananatha Shetty. 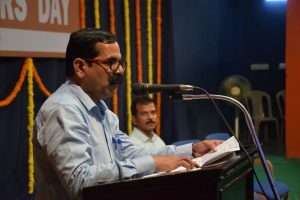 He was addressing the student gathering as the chief guest of ‘Achievers’Day’ observed at SDM College Ujire at Indraprastha, on 16 March. “Academic certificates are important on college level, but they do not validate an individual’s talents. Nor does it mean that the student has acquired applicable knowledge. It takes motivated efforts towards expanding one’s own boundaries through exploration of factors beyond what is taught in classrooms for that to happen”, he added. “Each one is blessed with a set of skills and talents. Each one must exert efforts to discover and nourish them, so that they shall contribute towards our holistic growth. India does not lack for human resources, but it does lack skilled humans. There are individuals who possess degrees but are unable to write applications. In order to avoid such scenarios, every student must ensure that he or she ventures beyond the academics and develops a skill set. 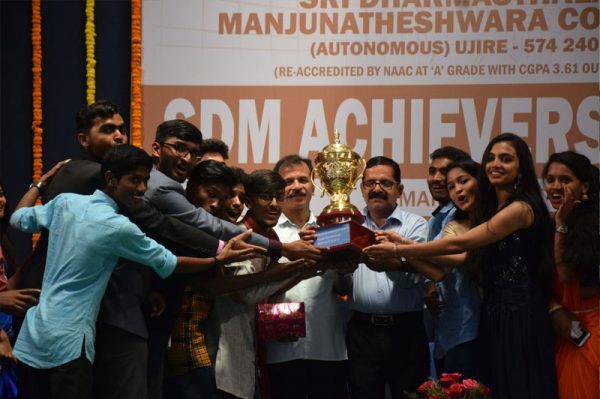 Cultural and sports activities are extremely helpful in this direction”, Dr. Shetty continued. The Principal of the college Prof. T N Keshava congratulated all the achievers and wished them the best before they were awarded.